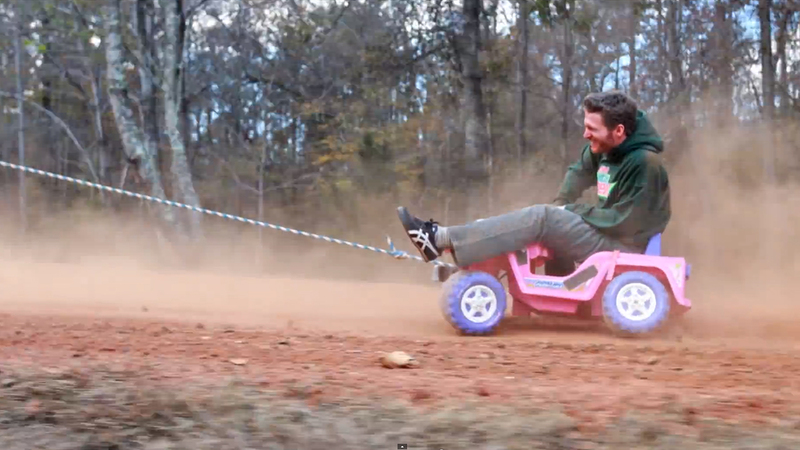 Ever think you’d see Dale Earnhardt Jr. riding on a pink Barbie 4×4? I’ll assume the answer is ‘no’. And that’s exactly what happened when Earnhardt teamed up with Mountain Dew and thrill-seeking YouTube star Devin Graham for a ‘Cardboard Rodeo’ at Junior’s Dirty Mo Acres in N.C. Take a look as Junior and Graham find some creative ways to get around the dirt track. That’s pretty incredible. And we assume slightly dangerous. They also put together a behind-the-scenes video to capture how it all went down. Are Power Wheels allowed to run at the NASCAR Camping World Truck Series ‘Mudsummer Classic’ at Eldora Speedway? Well, they should be.